It’s well past two in the morning halfway round the world and for the last four hours I have been glued to the screen of my phone following the news. Barely an hour before hearing about the terrorist attack in my city I was chatting with a Japanese I had just met and he mentioned the ISIS attacks in Europe. I told him Barcelona had been spared so far. So far. I am deeply saddened by this meaningless act of violence but proud to see the solidarity that the people of Barcelona have shown in these hard moments, and I am even prouder to see messages of support coming in from all over the world. I have yet to visit a place where the mention of the name of my city did not elicit a friendly smile. That spirit will not be broken. The world is welcome at Barcelona and Barcelona is welcome in the world. A short ride to lake Leman? Nope. Not at all. In fact, as I write these lines before going to bed, I am still almost 100km from it, but I don’t regret a single thing, today’s route has been just marvellous. My Exped mattress died and by the time I decided to do this trip it was too late to get a new one, so I took one of those self-inflatable mats. I takes up twice as much space as the Exped and is about five times thinner, so if you sleep on your side, like I do, it is very uncomfortable. Add to that a very hard ground on the campsite and heat that did not give up all night, and you can imagine how much sleep I got. At 8:00 I had already packed everything up, eaten breakfast and was ready to go. The night before I had been studying the map and saw that even though it claims that the route has 21 mountain passes, in fact it is not possible to ride them all without having to double back, as there are alternative routes besides the main one that take you through those other passes. 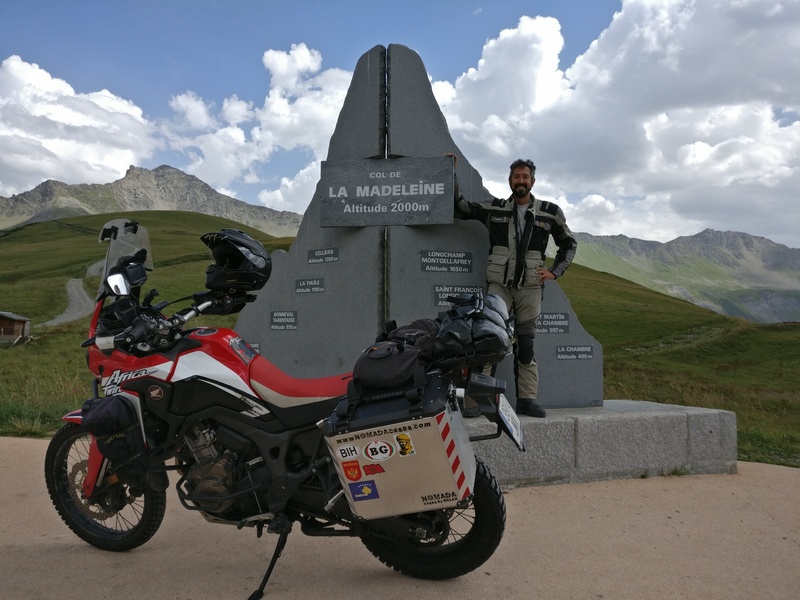 While planning the route the night before I thought that it would be a pity to miss some of the legendary ones, like the Col de la Madeleine, so I decided to plan a bit of a scenic route. The ride to Gap was as good as it gets – just past Sahune the road was amazing, the air cool and the music on my iPod spot on. This stretch of the D94 between Sahune and Serres is a blast. When I reached Gap the GPS sent me through the ring road to avoid the centre, only there isn’t one, so it creatively made one up through some residential neighbourhoods. I ignored it as soon as I realised what it was doing and took the proper route (which does indeed cross the centre). 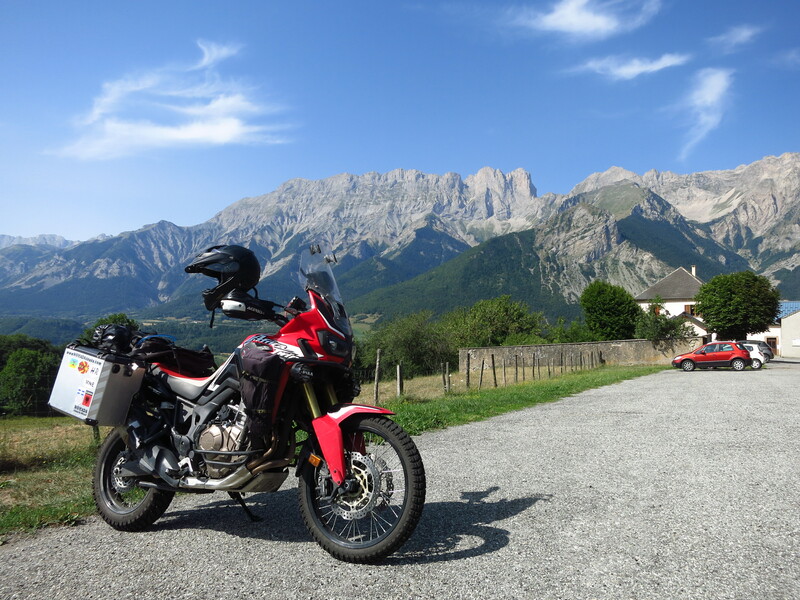 I left northbound on the legendary Route Napoleon – yes, the same one as in the Bond movies, but not the bit in Cannes – which goes all the way to Grenoble, but I left it shortly after, in Corps, to take a smaller road to Sainte-Luce and the first pass of the day – the Col de l’Holme. 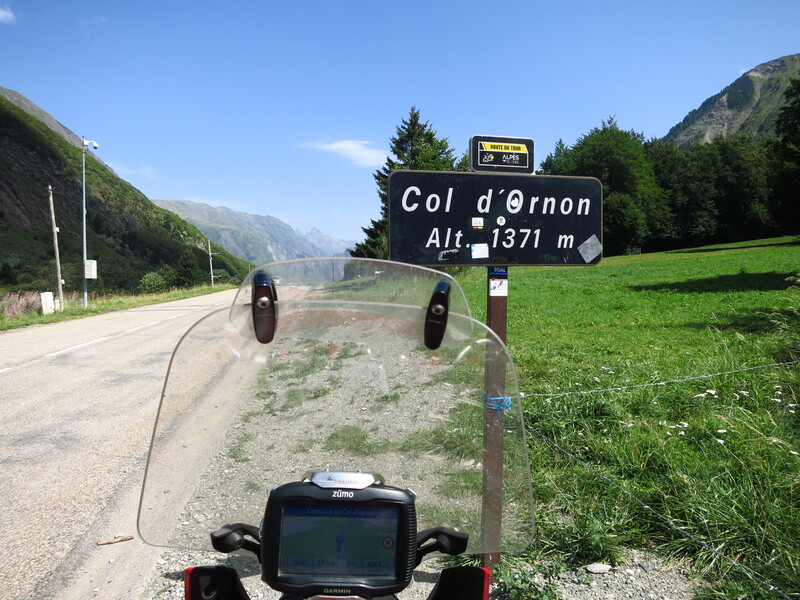 A very narrow mountain road took me up and down thick forests and I crossed two more passes – Col de Parquetout and Col d’Ornon – before joining the main route in Allemond and heading to the first two serious passes – Col du Glandon and Col de la Croix de Fer. Right after Allemond it was clear I was in hairpin paradise. 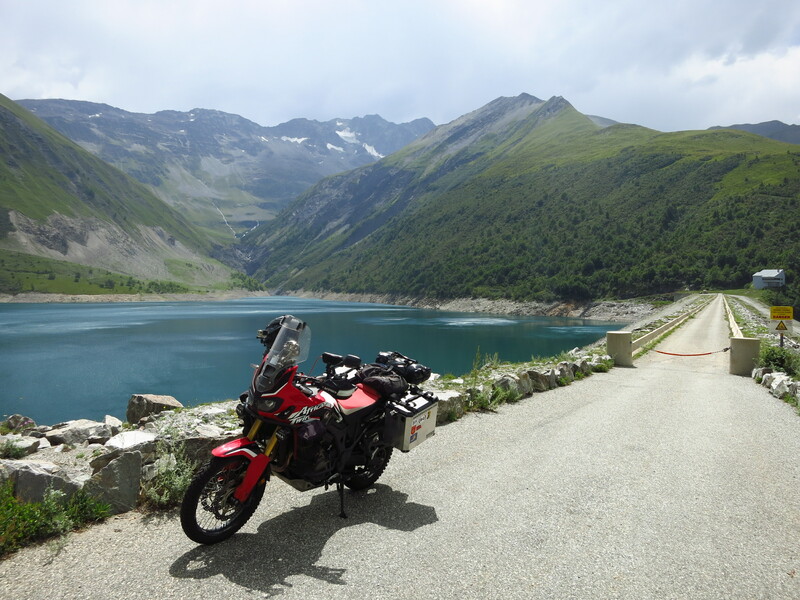 The road up the valley past the impressive Lac de Grand Maison was the exclusive preserve of cyclists and bikers. There was the odd car here and there, but never had I seen a car look so out of place on a road. At the top of both passes, dozens of exhausted but thrilled cyclists were taking pictures next to the road signs. I too took a picture but, seeing them, I almost felt as if I did not deserve it. I must say that I have the utmost admiration for all the people I saw today cycling their way up those roads. From the top of the Col de la Croix de Fer I could see thick clouds gathering ahead, so I hurried down the other side, hoping to outrun the rain that looked certain to come. The way down to St-Jean-de-Maurienne was, if anything, even more impressive than the ascent – narrow, steep, with impossibly deep gorges. There were far fewer cyclists attempting the pass from this side, but those doing so must have been superhumans. Back at the bottom of the valley, I could have taken the A43 and ride north to my final destination, as it was getting late, the sky was growing darker and I was tired. 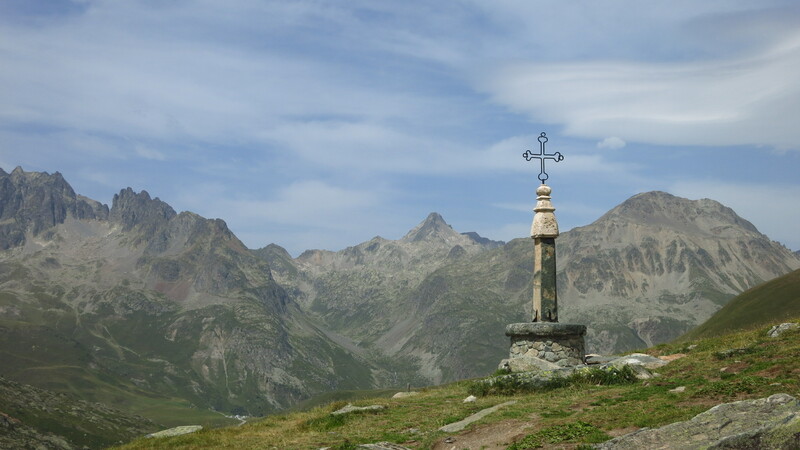 On top of that, the muscles on the left of my chest were aching, possibly from the night before but my scenic route for the day was not done, there were three more passes to go, among them one that has become a household name – the Col de la Madeleine. I left the A43 and started the ascent on a winding road through a thick forest. The hairpins were tight, but the road was not as narrow as the one I had taken to the first passes in the morning. Then, it opened into a vast lush green valley and wound its way to the top with amazing views. The storm clouds were still looming behind me but, so far, I had managed to stay ahead of them. As I was taking pictures at the top of the pass I saw two couples from Spain on two Super Ténérés, one of them a blue First Edition just like the one I got stolen. I approached them and as we got talking and I told them the story the guy on the blue one said it sounded familiar. It turns out he got his from the same dealer that was selling mine, and he had told him my story! The world is indeed a small place. Riding the Madeleine meant a detour to Albertville and then having to ride southwest before going north to Annecy. As I was riding down I saw curtains of water in front of me – the rain I had so far been escaping was right there on my way, waiting for me. The tarmac was soaking wet, showing that this was a classic summer downpour which would get me wet in a matter of seconds. Fortunately, just before I reached the rain, the GPS told me to turn right into another valley where the sky was not so dark. 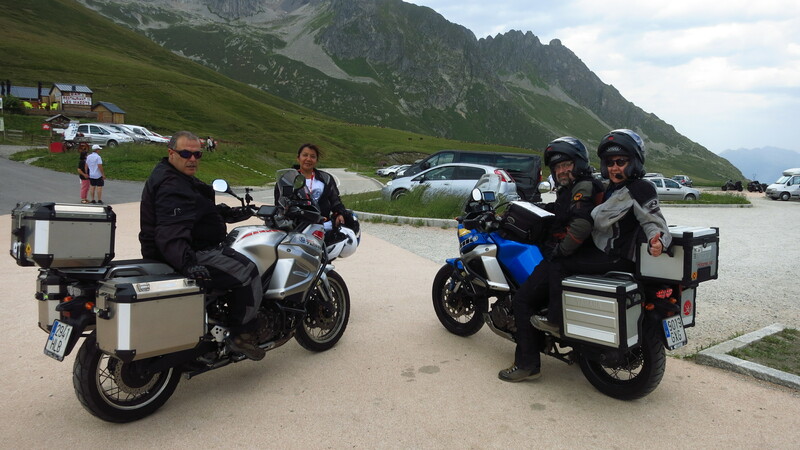 It was the way up the last two passes of the day – Col de Frêne and Col de Leechau. These are part of another one of the detours on the Route des Grandes Alpes and they are on a small road with no traffic at all. 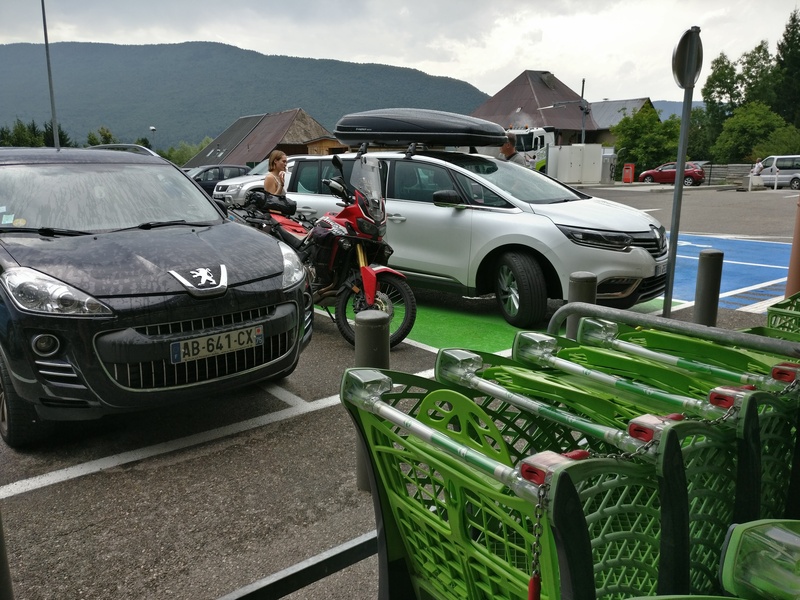 After passing the Col the Frêne I stopped for petrol in a village called Le Châtelard, and no sooner had I finished filling up and was ready to leave than the skies opened and the rain that had been chasing me for the last few hours finally caught me. I took refuge under the marquee of the Carrefour supermarket next to the petrol station and waited for the rain to pass as I checked the weather radar on my mobile. The rain clouds were moving fast behind my position, and I could see that the sky was clear in the direction to the next col, so as soon as the rain stopped I left. Shortly after the village the road started climbing in and out of the forest, and then, on a long sweeping corner across a steep field of grass I saw a small campsite above me. 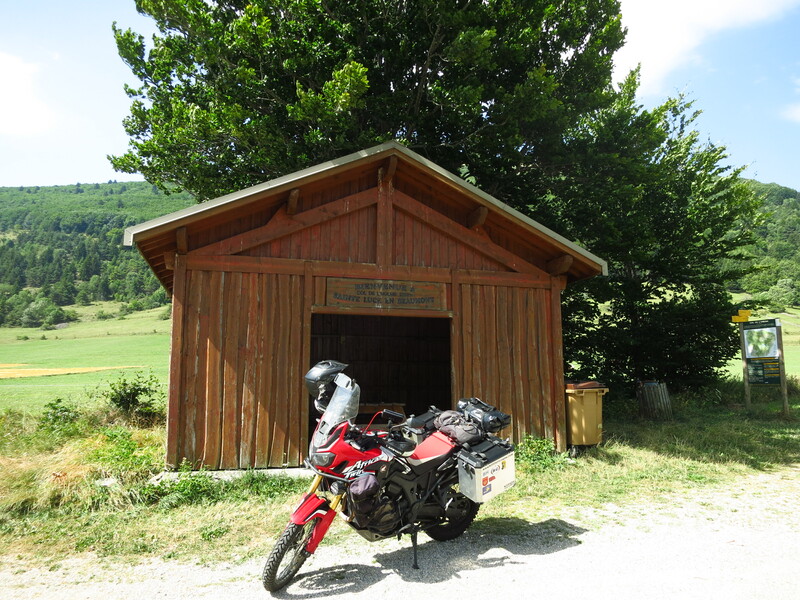 I still had about 90km to go before reaching lake Leman, but I usually trust my instinct when it comes to choosing a place to spend the night. I often pass several ones just because they don’t feel right, and this place seemed just perfect. Besides, it was already 18:00 and I was tired, so I turned around and headed up the lane to the entrance. 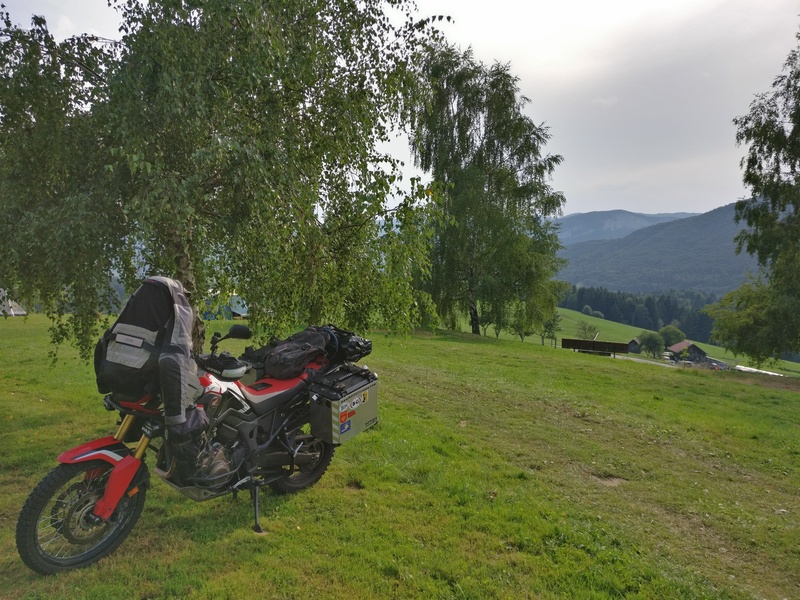 It was a tiny campsite, with only a handful of lots, perched at the top of a hill overlooking the valleys of the Massif de Bauges natural park. I planted my tent near the bottom, with great views, had a shower and went to enjoy the luxuries the campsite afforded. By luxuries I mean that, unlike the previous one, this one had a picnic table where I could have dinner, a socket to charge the camera batteries, wifi and a sort of reading room where I could sit down to write a bit. It wanted to become my new best friend since I had meat and cheese, and did not take its eyes off me for a second. Hypnotised, I couldn’t help but give it some, which only made things worst. A little girl came to get the dog, but she (it was a she, the girl told, me, and was called Framboise) refused to leave. 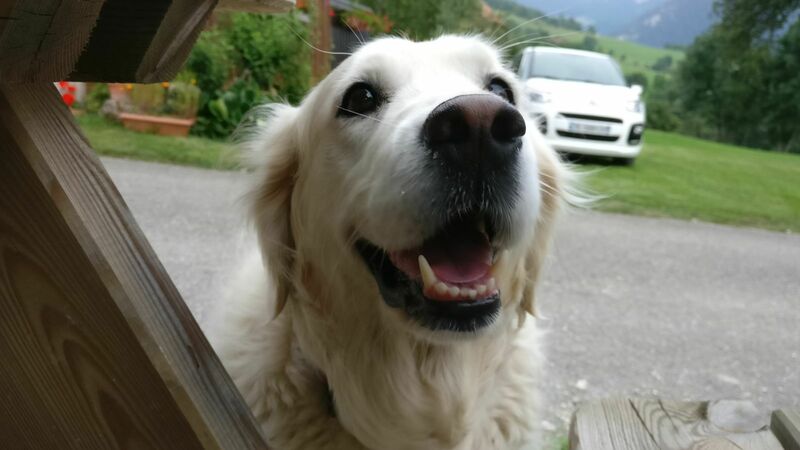 Only when I had given her some more, finished eating and packed away the food did she answer the insistent calls of her owner. 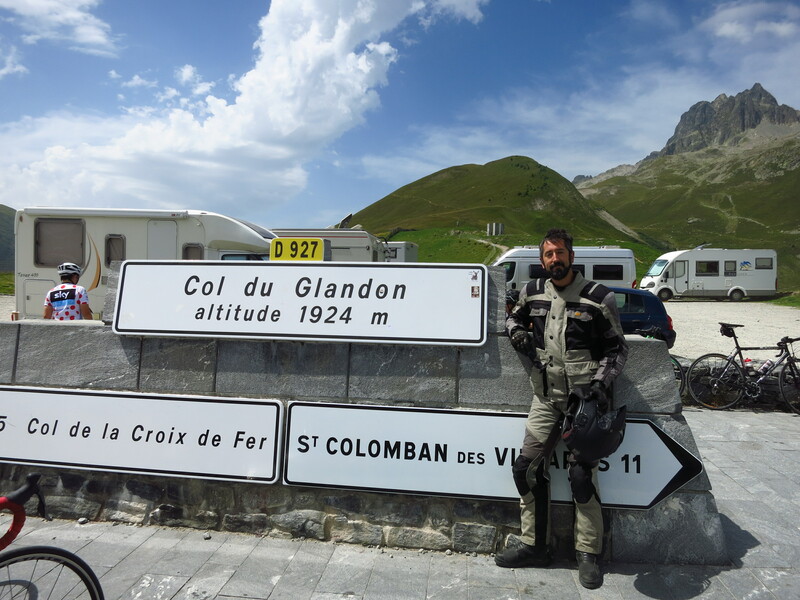 Travelling my motorbike attracts good vibrations. 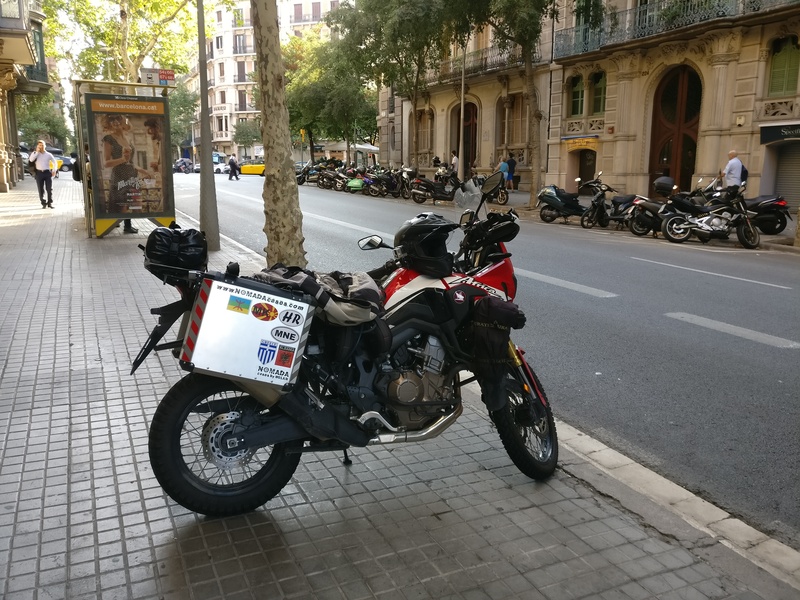 I have found that it is certainly one of the best ways of meeting new and interesting people, and as I was loading the bike, parked in front of my apartment, I was looking forward to the next few days on the road. What I was not expecting, though, was the first meeting to happen even before getting on it. “You live here, right?” I heard someone ask me. I turned around, surprised, as most people enquired about the bike, and saw a tall young guy holding a helmet. He pointed at a KTM 1150 Adventure R parked across the street and said “That one is mine”. I had seen that bike lots of times and wondered who the owner might be. It had knobbly tires and mud splattered here and there, showing it had been put to its intended use. He introduced himself as Marc and told me that we were neighbours. We chatted for a while and promised to go out for a ride after the holidays. I refused to pay tolls on the motorway here, so I headed to Ripoll to cross the border in Prats de Motlló, which is a much nicer route that the one all holidaymakers take along the A7. For the first few miles I followed the exact same route I take to work every day, leaving the city amidst the tide of early Monday morning commuters, but instead of being just another anonymous road user, I noticed that people were looking at me and the bike, noticing that I was going someplace else. Once away from the big city the sun came out and I thought the weather was perfect – clear sky, getting warmer but not too much as I was gaining altitude towards the Pyrennees… I was lost in thought when I noticed a black Alfa that had pulled alongside with two beautiful girls inside. The passenger smiled at me, took a picture with her phone and gave me the thumbs up. Hell yeah! 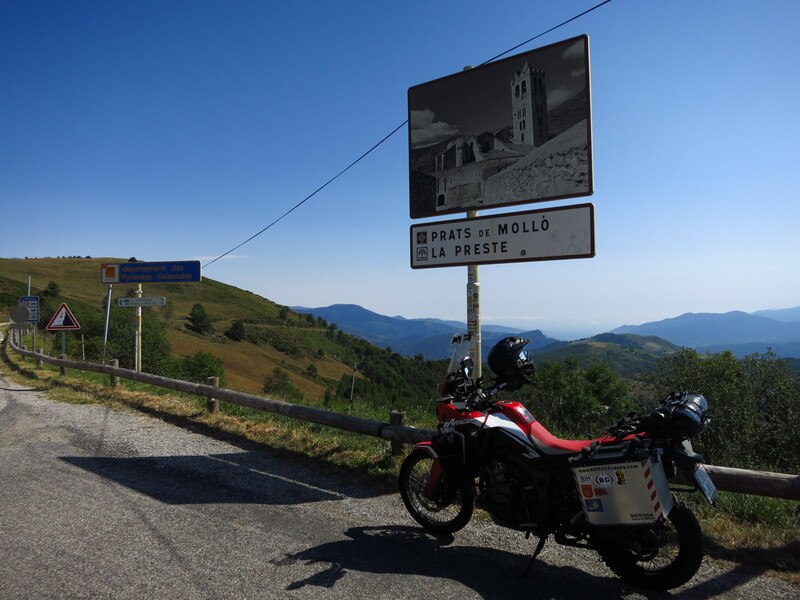 I stopped for petrol just before starting the ride up to coll d’Ares, the mountain pass that thousands of people desperately crossed in the winter of 1939, fleeing from the advance of the fascist troops in the last months of the civil war. Opposite the petrol station, there was a police patrol fining a French biker that had been caught by a speed camera in a hidden car a couple of kilometres down the road. Fortunately, a van coming the other way had warned me and I had slowed down just in time. I rode down into France through the gorges of the river Tech, always a nice route. When I reached Ceret I turned north into a small country road because I wanted to go a bit further before taking the autorute, and I discovered a few beautiful villages. 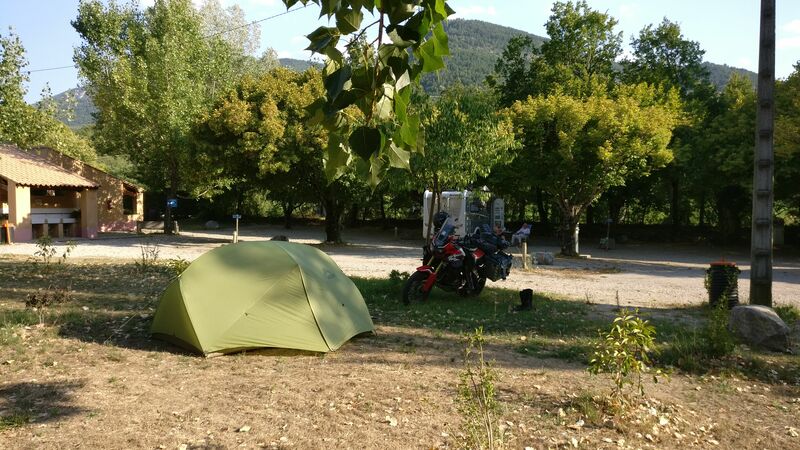 After lunch in one of them (Llauro) with great views over the plains opening to the Mediterranean, it got too hot to enjoy riding, so I took the motorway near Perpignan. 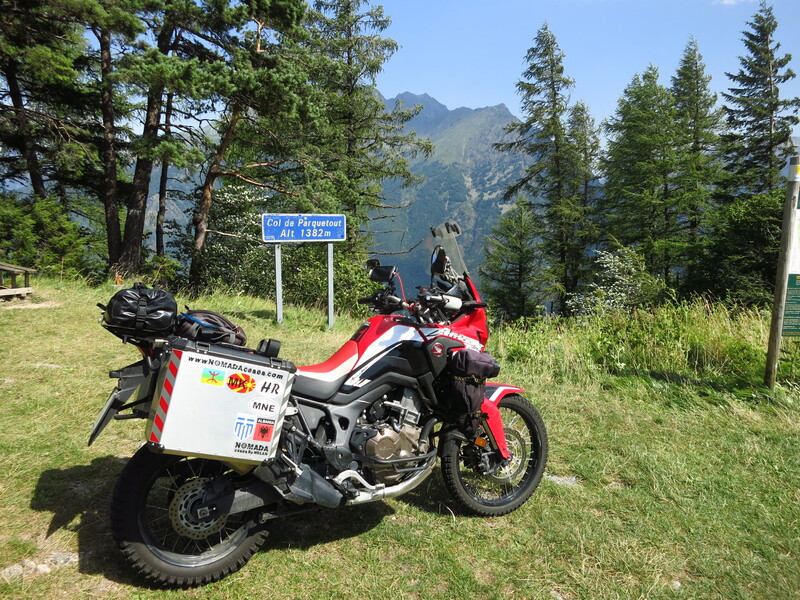 The plan was to reach Grenoble, find a place to sleep and do mountain roads the rest of the way to Thonon-les-Bains on the shore of lake Leman, where the Route des Grandes Alps begins. 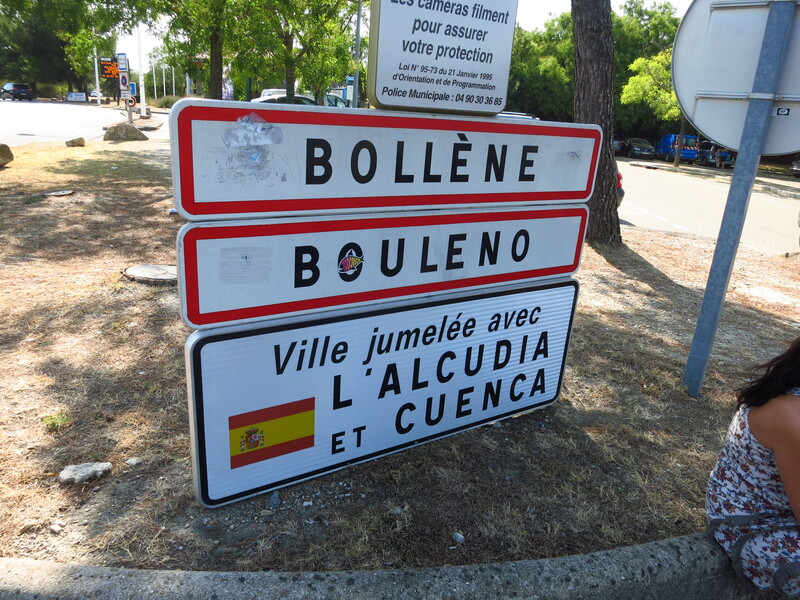 Near Nîmes, however, I was not so sure I would get that far. The temperature had been creeping up and for a while now it had been a constant 40ºC, I run into a traffic jam where the motorway splits to Marseille, and it did not get any cooler when I joined the A7 towards the north. By Bolène I had had enough and decided to cut east heading to Gap on country roads. I would find a place to sleep near there and complete the journey to Thonon-les-Bains the following day. Soon after leaving the autoroute things changed radically. I entered the area of the Baronnies Provençales natural park, the temperature dropped, the traffic disappeared and the wonderful French countryside opened before me. I usually say that I don’t like having to travel through France to get to other further destinations, but that is only because I have to do it on the motorway. Riding through these small, quintessentially French villages I remembered what a beautiful and varied country France is. I passed a few campsites before I found what I was looking for: a small municipal campsite by the river in Sahune. Quiet, cheap and next to a swimming spot. Gap was still a while away, but I was sweaty and tired, so I decided to camp there. A week after receiving the rim, I finally found some time over the weekend to get down to it – it was final exams week at work and those days are always hectic. 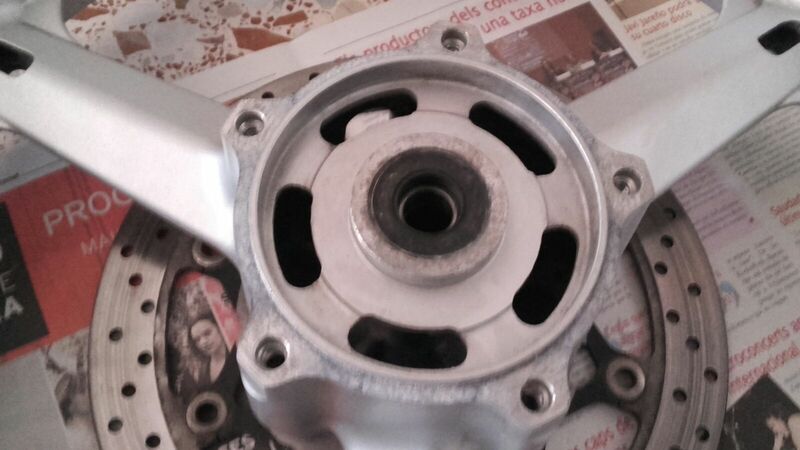 I had to remove the brake discs from the damaged rim and install the onto the new one, which I expected would not be an easy task, since the five bolts holding each disk were glued to prevent them from coming loose. Then, there were the bearings. The rim I had bought had them fitted, but I did not know whether they would be in better or worse condition than the ones in the old rim. So, the plan was to paint the rim over the weekend (it was silver, remember), as it required a coat of primer and 24 hours later at least one coat of matt black paint, and then on Monday take both rims and the tire to the shop and have the brake discs transferred, the bearings checked and swapped if necessary and the tire fitted. Once I got to my parent’s place, however, my father, a retired mechanic, engineer and all-round DIY genius, checked the bearings and found that the ones in the new rim were in much better condition, so they did not need swapping, and he also said he felt confident that we could remove the bolts in the disks ourselves. Seeing a chance to get all the work done in one day, I started to have doubts about paining the rim and delaying things a further couple of days. On top of that, several people had told me that I should keep the rim in silver, as the V-Strom had had a long life and it was a fighter, so having mismatched rims would only add to its charm. The front left indicator is still held together with duct tape since the wind toppled the bike in a fjord in 2013, so I thought they had a point. We set about removing the bolts, which required a long enough lever and a determined hand. 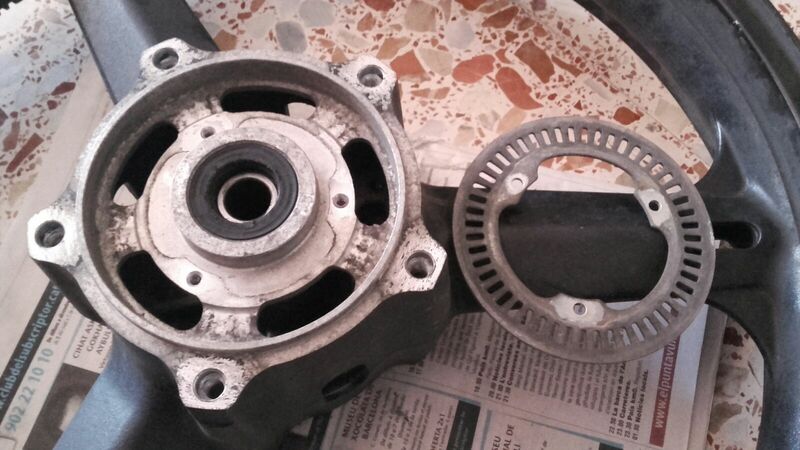 Then I removed the ABS sensor disc, and when we were going to fit it on the new rim, we got an unpleasant surprise. 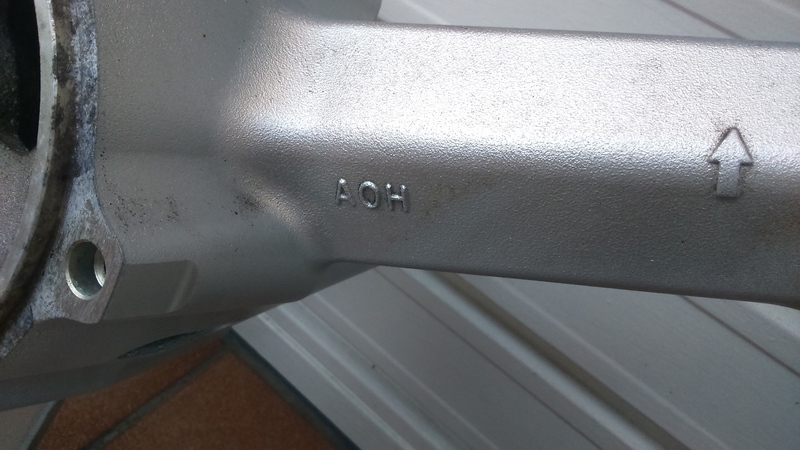 Even though the rim was for the 2007 to 2010 model, had the exact same codes as the one on my bike, had the disc brakes mounting points in the right place to make room for the ABS sensor disc, and the disc fitted snugly in the space provide for it… there were no mounting holes for the bolts that held it in place! 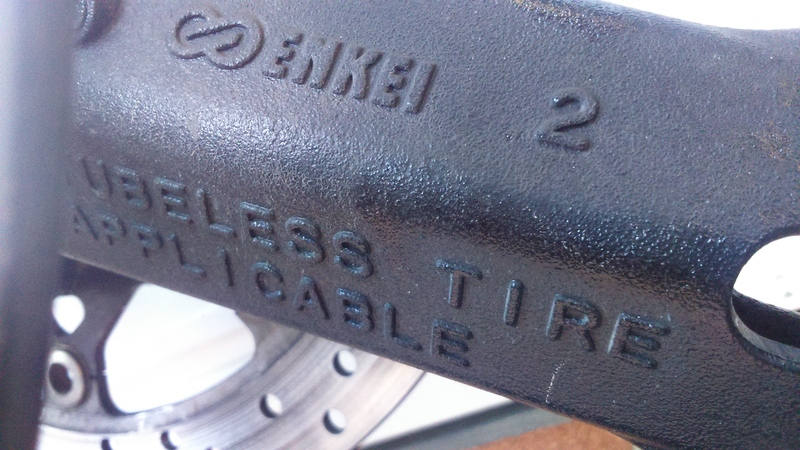 I could not believe it… Suzuki modified the rim then ABS became available in 2007, but apparently only drilled those holes on models equipped with it, which I personally think is an extra complication in the production line. Why not make all rims the same? We were not going to let that drawback stop us now, so out came the tool collection that my father had built over decades and we tackled the problem. We drilled three holes and, with a specialised tool, cut the thread for the bolts in them. The ABS sensor disc was perfectly secured in position and then we mounted the brake discs. 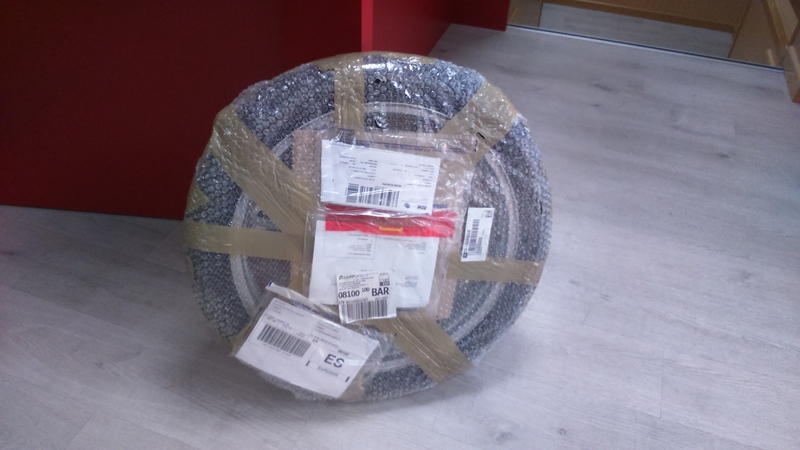 I managed to find a tire shop that was open on a Saturday afternoon and got the tire fitted at the moment for 20€, and the whole wheel finally went back onto the motorbike! All in all, it has taken almost a month, but my pockets are much happier than if I had had to pay for a new rim! Strap it to the back of the AT, ride all the way to Astrakhan and have it fixed there. As tempting as that sounded, I did not have the time nor the money for it (yet, but I want to go back there in the future). 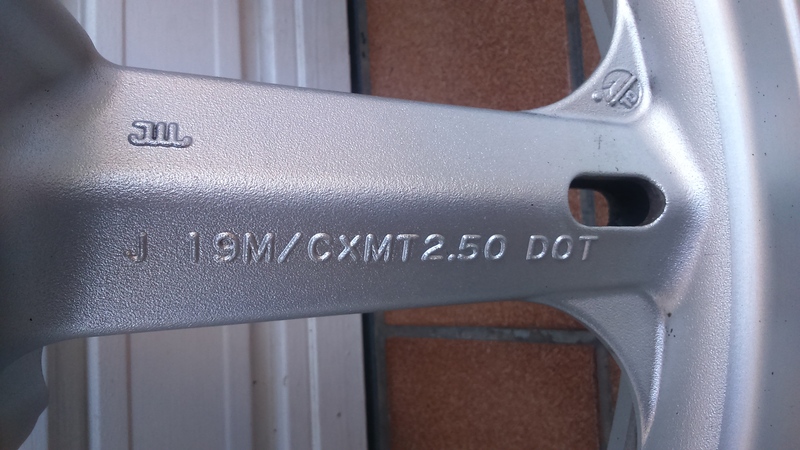 List price for a new front rim is over 500€, which must be about half as much as my 160,000-kilometre bike is now, so that was also out of the question. Now, that was a more realistic option. I first went to see Fabio at Hamamatsu Motor and told him my story. He agreed that a used rim was the best alternative, and quickly found one online, but it was sold through a professional breaker and it was a bit too expensive. 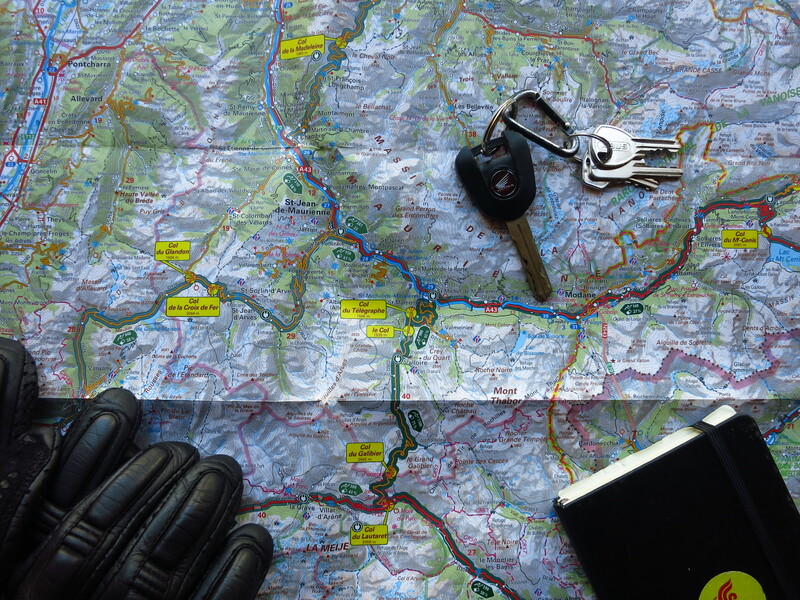 The cheapest option might be to source one from a private seller through motorbike forums and online ads, so we agreed that I would try that and if I could not find anything, he would order the one we had seen. The problem is that anything at the front of a motorbike (rim, forks, headlights, etc.) 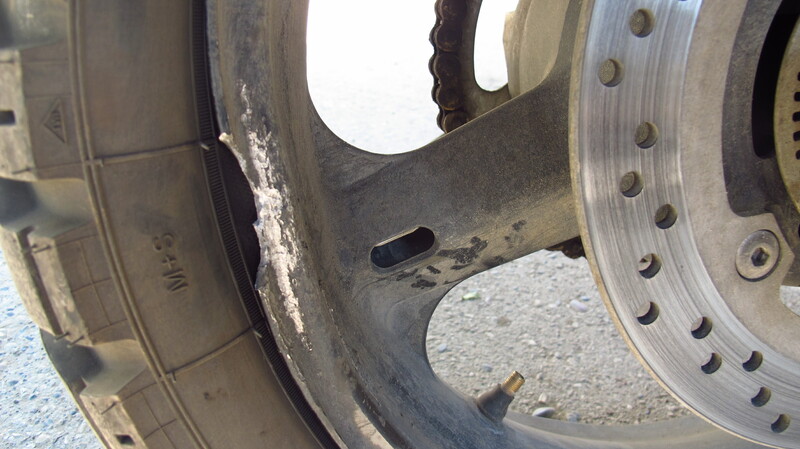 is what breaks first in most accidents, so finding a good rim would be complicated, especially if I wanted it fast. 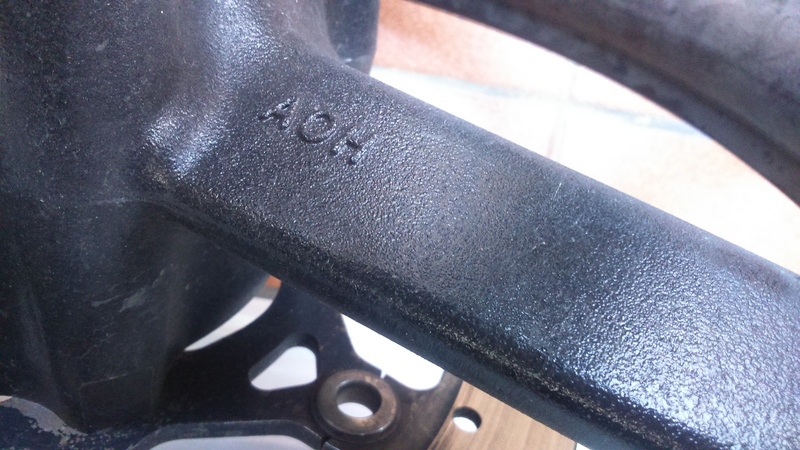 To make matters worse, despite looking practically identical, the wheels for the ABS and non-ABS model are not interchangeable, and the V-Strom 1000 wheel is not compatible either. I spent a week visiting different sites and managed to locate up to four different rims, but they were all from non-ABS bikes. I located one that looked promising in southern Spain – it was in good condition and it was cheap, but for some reason the guy selling it kept me waiting for four days before confirming that it was for a non-ABS model. Argh! I called Fabio to order the one we had seen, but it had already been sold. These things go fast! I went back online and finally managed to find the right one: ABS, 2007 model. The problem was that it was silver, not black. And in Italy. And more expensive than the other ones I had found… But at this point I could not afford to go on trying to find a good deal, and it was still way cheaper than a new one, so I ordered it. A week later, it was delivered. I took it home, opened the package and checked that it was the right one. So, time to get the rim repaired! I thought it would be a good opportunity for some Top Gear-style useful consumer advice. 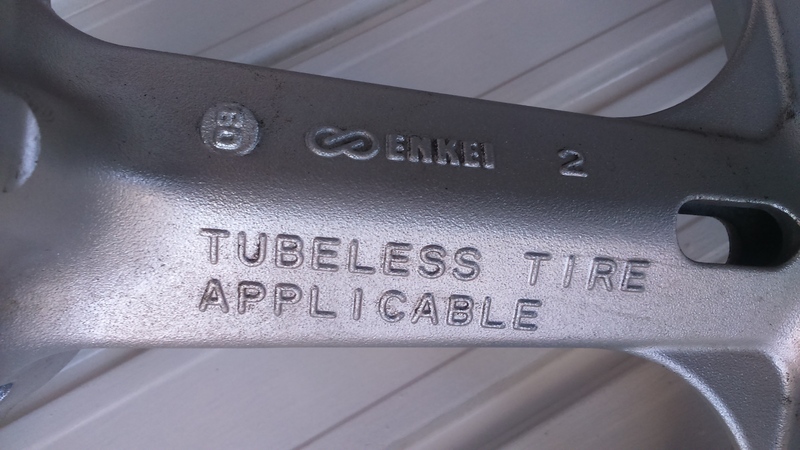 Where is it easier to have a rim fixed? In Astrakhan, a 500,000-inhabitant city in the Volga delta I was completely unfamiliar with and with a language I did not speak, or in Barcelona, my hometown? Let’s compare experiences! 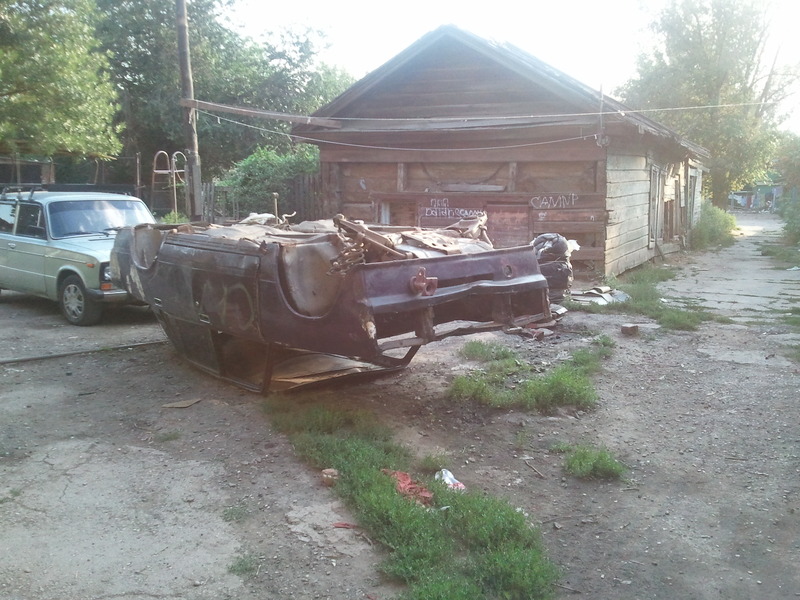 Finding a workshop that would repair the rim proved to be a lot easier than in Astrakhan. I just had to Google it, check out some opinions on bikers forums and choose one. In Astrakhan I had to wander round the centre until I found a biker gang, enlist the help of one of its members, Arkan, and trust he would know what he was doing because he did not speak a single word of English. So, the first point goes to Barcelona. 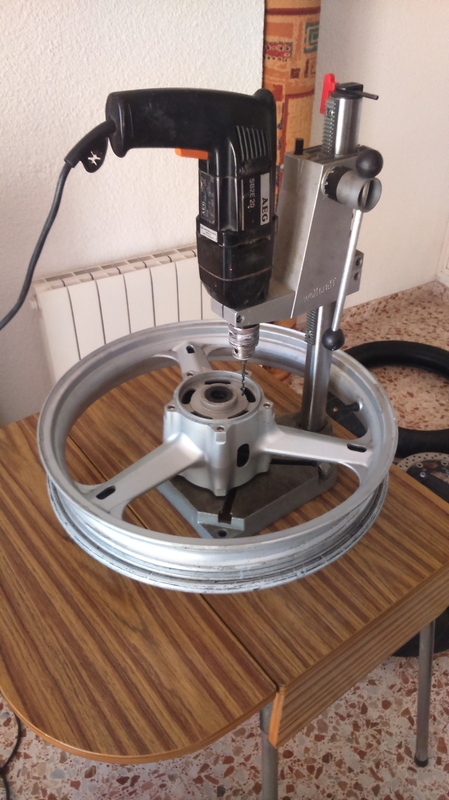 I contacted XR Llantas, which build and repair wheels of all kinds, both for individuals and competition teams. They have a very good reputation and trusted they could do a proper job. I sent them pictures of the damage to the rim to see whether it was repairable or not. They said that they needed to see the rim to confirm, but it looked possible. Once I had removed the tire from the rim, I took it to their workshop in Barcelona on a Monday morning. The place was smaller than I expected,there were rims of all kinds in every available inch of space in the shop, but it seemed they clearly knew their business. I gave the rim to a guy who inspected it carefully and said that they would need to carry out some tests (he mentioned infrared light and ultrasound) to see if they could repair it. 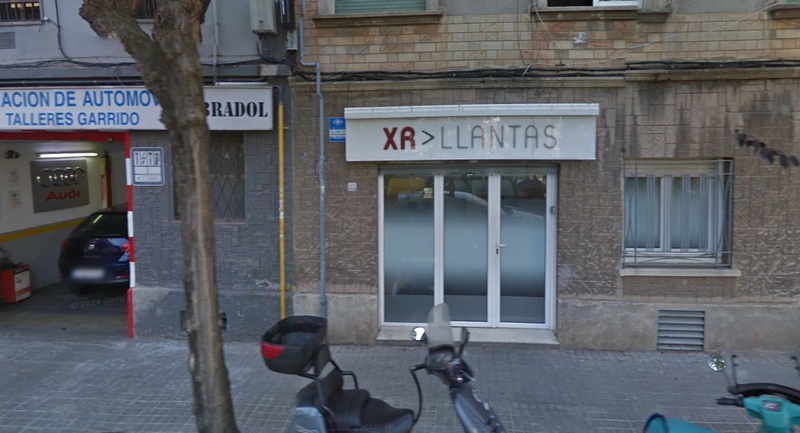 Compared to the junkyard Arkan took me to in Astrakhan, this looked like a NASA lab, so Barcelona 2 – Astrakhan 0. They said that they were very busy and would not be able to get it done until at least Thursday. I was using the AT in the meantime, so it sounded reasonable to me. At least I was not stuck in the stifling heat of summer in Astrakhan. A week later I still had not had any news from them, so I called. They mentioned that they had started looking at it, but had had to stop because they had more urgent business. The guy I talked to on the phone was not the one in the workshop apparently, but he said that he thought that the wheel would be ready the following day, and that they would call to confirm. That was eight days, while in Astrakhan it only took from Monday to Friday morning. Barcelona 2 – Astrakhan 1. Tuesday came and went with no news, and I was too busy with classes to call. Back in Astrakhan Arkan had called when we said he would. Barcelona 2 – Astrakhan 2. I called the shop on Wednesday morning and the guy on the phone sounded surprised that they had not called me the day before, as he thought the rim was already repaired. He promised to talk to the workshop and call me later. Half an hour later I got the promised phone call, but not with the news I was expecting. 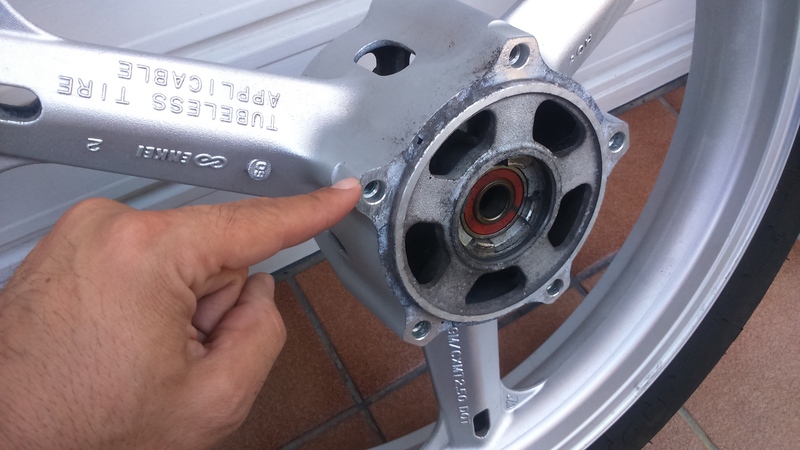 They had run their tests and determined that he wheel was too badly dented and bending it back into shape would weaken the aluminium too much and there was a risk that it might crack and cause an accident. So, it was not repairable. In Astrakhan they took a wheel in much worse shape than this one, fixed it with no objections in four days and it remained usable for two more years and thousands of kilometres, after which it developed a microscopic leak and I had to have replaced. Barcelona 2 – Astrakhan 3. There you go, then – if you want something fixed, get a Russian mechanic to do it.